Microsoft has a couple new mice coming out today with some simple features that make using Windows 8 a little bit easier. First up on the the fancier end is the Sculpt Comfort Mouse, which will be on sale in June. 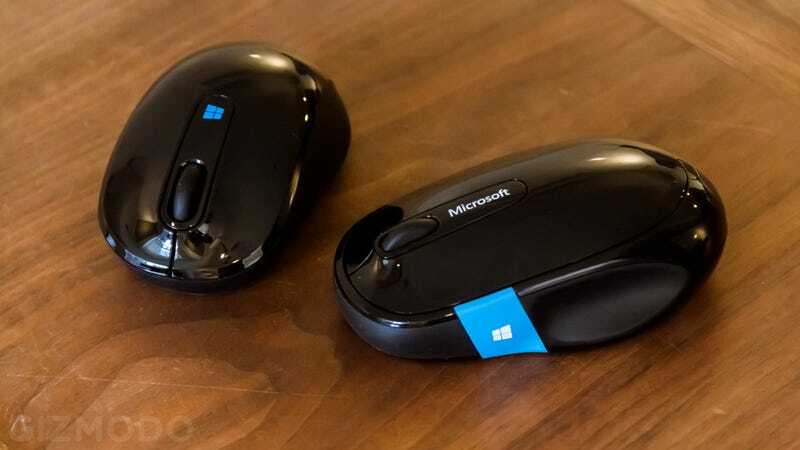 It's $40, connects to your computer or tablet via Bluetooth, and is the first Microsoft mouse with a blue, touch-sensitive Windows button that gives you a couple of shortcuts. Press it and it'll take you directly to the start screen, or use this button to swipe through all the apps you have open. The more basic model is the Sculpt Mobile Mouse. Available later this month, it costs $30 and features four-way scrolling, meaning you can tilt the scroll wheel up down, left, or right. We played with both of the new mice and found that they were comfy and responsive, giving you that little extra something you want out of an accessory. Plus, they're a nice match to multitasking on Windows 8.